Discounted CFLs: Save money and energy. We’ve partnered with District of Columbia Sustainable Energy Utility (DCSEU) to offer discounted GE CFLs in our DC stores* through Sept. 30, 2012. This program lets you stock up on CFLs and truly realize energy savings (about $42 or more in energy costs over the life of the bulb). Not sure exactly what kind of CFL you need? Check out this lighting guide or stop by one of our stores and talk to an associate about what will work best in your home. 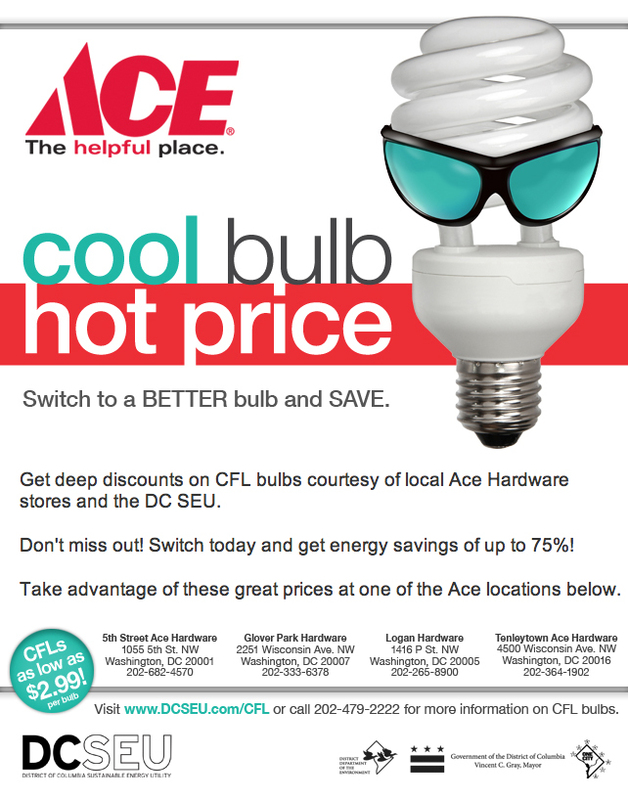 *This promotion is only at Tenleytown Ace, Glover Park, Logan and 5th Street Ace Hardware, but we carry CFL bulbs at all of our stores. Input into the products we’ll carry, as well special programs and workshops you’d like to see take place. Insider updates as the store build-out progresses. Monthly coupons to use when the store opens. An invitation to the [private] Grand Opening reception. To sign up to be a Founding Member at Woodley Park Ace, please send an email to founder@acehardwaredc.com with your name and email address in the body of the email. We look forward to seeing you soon! with your name and email address in the body of the email. We look forward to seeing you soon!